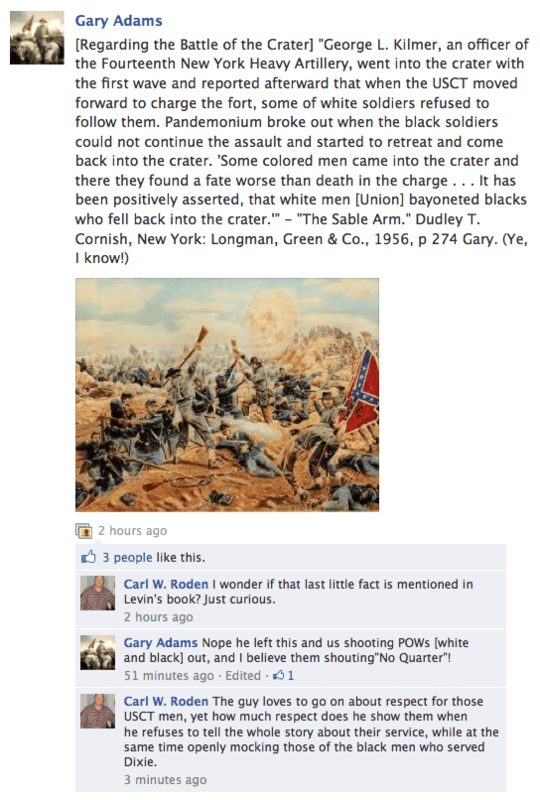 I knew it was just a matter of time before the good folks at the Southern Heritage Preservation Group got around to commenting on my new book on the battle of the Crater. They don’t disappoint. Now you would think that the confidence with which Gary Adams asserts that the quote in question is not included in my book would be based on having read said book. These boys obviously are not playing with a full deck. On page 24 of my book not only will you find the Kilmer quote, but you will find two additional references, one which confirms Kilmer and another which references white Union soldiers firing on their black comrades. In addition, there are numerous references to both black soldiers and Confederates shouting “No Quarter” as well as an analysis of its significance. As Brooks Simpson likes to point out, it’s the gift that keeps on giving. What a bunch of knuckleheads. Watching the thread evolve is like watching the blind lead the blind. I have absolutely no problem with differing interpretations of specific pieces of evidence, but to be so openly dishonest is just inexcusable. Isn’t Adams the president of this group? And they wonder why they are considered to be such a laughing stock. It’s hard to imagine that 2 years ago a Virginia Textbook came under attack because the author stated that there were thousands of blacks who fought for the Confederacy. Well, how did the story end in 2010? Virginia’s Education Department approved the textbook. They conveniently leave out the fact that the book was approved without the reference to Jackson’s black soldiers. It’s helpful to remind oneself that this is not really an organized group; rather, it’s a small group of individuals who happen to spend time on a specific site just as readers of CWM do. What binds them together, however, is their utter shallowness and, on occasion, outright stupidity. Case in point is their president’s statement about my book. It’s helpful to remind oneself that this is not really an organized group; rather, it’s a small group of individuals who happen to spend time on a specific site just as readers of CWM do. What binds them together, however, is their utter shallowness and, on occasion, outright stupidity. It’s helpful but not entirely true. The SHPG are but an online parody of the reality. Living in Georgia I can tell you that this mindset seems absolutely everywhere. Last weekend I saw someone put up a stunning argument that East Tennesseans were Lincolnites. He used that knowledge to clarify why East Tennessee felt it important to attempt to secede. I had great enjoyment by submitting a question about the accuracy of his statement given that Lincoln was not on the ballot in TN. But I digress. I see this mindset all the time. It permeates itself into a radical faction of “anti-government” zealots. The irony in that is these same people would be in favor of the federal government regulating moral decisions. They all share a modern political state of mind which they project onto the past. Living in Georgia I can tell you that this mindset seems absolutely everywhere. I’m sure at times it does seem as if this mentality is everywhere, but than again we know where to look for it. I think all of you are taking the wrong approach here. I’ve highlighted the utter ineptitude of Gary Adams and other members of the SHPG before (with posts ready in the hopper, by the way). They are a real threat to advocates of Confederate heritage who want to be taken seriously. After all, it was not difficult at all to discredit their attempt to provide input to the folks protesting the Forrest monument in Selma by providing them links to evidence of the group’s historical ignorance and dishonesty. Every “success” they publicize offers an opportunity to discredit them still more. Let’s put it this way: if people wanted to mock advocates of Confederate heritage, they’d invent the SHPG. I find it sad that they didn’t even take the few seconds it would have taken to check for themselves. It’s in the index for goodness sakes!!!!! Like I said, most of these folks are not playing with a full deck.